Every year could be the year. Even this one. Especially this one. That’s what we’re all thinking as the baseball season begins today. During this time of year, there is still a chance for all of us. Tigers, Nationals, Twins, and Rockies fans alike all share in this feeling. Until proven otherwise, every team could go the distance this year. This could be the year. It’s an annual tradition that we never fail to observe. I wrote about it last year, right about this time, for the Eastern Echo. I wrote of the hope that comes in Spring, both for those who should be hopeful and for those who have nothing better to do than be hopeful. It’s a hopeful time of year. Last year around this time, my entire life was changing. I was graduating, getting married, and moving away to start graduate school 700 miles from the baseball team that anchored me so firmly. It was a hopeful time after a long, arduous winter ahead of a summer of upheaval. And that hope was rewarded with a great season and run deep into October that made me feel close to home while I was far away. The view from a year later is much clearer. Much less tumultuous, but no less hopeful. The last year for me has been a good one, but it was also taxing and trying. The stress and anxiety that came with such big changes dampened some of the joy that one might expect to find in a baseball team that comes within four wins of a World Series. Which makes this Spring, this moment, sweeter. Those changes are behind me and with unclouded eyes, I can embrace the 2013 season and the prospect of a title. It’s almost as if the Tigers were waiting for me. I had to take the next step before they would. The two aren’t connected, but I’m going to believe that they are because, damn it, this is the time of year when everything makes sense. The sun shines brighter and the prospects of a glorious summer are unrestrained. This could be the year. For the Tigers. For me. For anything. I’m a pretty rational and analytical person, a true child of the enlightenment. But sometimes, and this is one of those times, the romantic in me emerges. Things are bigger than us and the world is a magical place full of wonder. Sure we can debate all the reasons something shouldn’t happen, but is there anything better than watching a team who has no business winning a division title pour out onto the field to celebrate that title? I mean, it’s hard not to get romantic about baseball. We all know that. It overwhelms us sometimes. When Adam Greenberg gets another at bat after getting hit in the head after his first and only prior at bat, that’s when it’s hard not to get romantic. Or when Darrin Downs takes the mound three years after a fractured skull nearly killed him. That’s when it’s hard not to get romantic about baseball. When your team sprays champagne and the grumpy old man who managers the team starts crying like a baby and waxing poetic about your city, that’s when it’s hard not to get romantic about baseball. So I’m getting romantic in anticipation about all of that. About the flyover before Opening Day and the crowd on their feet for the nobody journeyman closing in on a no-hitter. About the kid from a small town about to take the big stage for the first time. About the fathers and sons sharing a game for the first time. About watching your team finally, finally hoisting the trophy. Right now, at this moment, all of that can happen. It will happen. For some of us at least. My hope for all of you, as it always is, is that your faith will be rewarded. This could be the year, it really, really could. Now this cannot be thought of as an exhaustive list or a list that perfectly ranks the quality it seeks to. Rather, this is a list of Nine people who make baseball fun, without a particular guarantee about who is left off and who is ahead of who. However, let’s also think of this list as one that doesn’t include baseball players. This is about people outside of the clubhouses and front offices. In some cases, like in most good stories, they are composite characters. What follows, is The Nine People Who Make Baseball fun. Because, after all, that’s what baseball is. Fun. Here’s what I like about Karabell: He’s not reactive and he loves baseball. So many people who follow and cover sports react to everything as if it dramatically reshapes the landscape of the entire sports world. Karabell says not so fast. He doesn’t accept that one bad game or outing changes a season. He makes for good listening and following because he can walk you down off the edge when things are looking bad and keep you from getting your hopes up when things are great. But on the other side of it, he is such a fan. He openly professes to watching his team when they stink and enjoys going to Fall League games and minor league parks, and once confessed to being disappointed during the postseason because he couldn’t watch ten games at once. You all know this guy. The one who still sees baseball through the prism of 2008. Like all of the players he thinks are good are getting old and he’s never heard of anyone under 25. He thinks $10 million is a big salary and can’t fathom why anyone would offer a ten year contract. This person makes baseball fun because you can exploit their ignorance for entertainment. Hey guy, who is better, Jason Heyward or Jason Werth? I’m not talking about people asking Buster Olney if he thinks the Yankees will trade A-Rod. That’s stupid, but it’s not what I mean. People, mostly on Twitter, routinely ask “experts” to answer factually based questions like “Who is starting tonight?” and “What time does the game start?” Have these people mastered Twitter, but have no concept of Google or MLB.com? How is tweeting at a sportswriter the most effective way to gather that information? These people make baseball fun because they are funny in a sad sort of way. Placido Polanco: “Poblano.” This is a type of chili pepper. Rick Porcello: “Portabello.” Notice, this isn’t just here replacing a food name for a player name, this is a hybrid of the two. Scully’s pipes are incredible and he’s been working the same glamorous gig for more than a half century. Hiss soothing voice and mix of baseball acumen and catalog of great stories makes him the best announcer who doesn’t work for your team. I love Mario and Rod, but Scully is the best of the best when I take my blinders off. I can’t tell you how often, after a Tigers game ends, I flip on the Dodgers feed to listen to Scully call a Clayton Kershaw start. He’s baseball’s answer to easy listening. Brian Kenny is MLB Network’s sabermetric mouthpiece and Reynolds is as old school as they come, once saying that the Triple Crown “is the [MVP] trump card.” Kenny draws on analytic thinking and research while Reynolds goes with his gut. If you know something about this site, you might think I’d prefer Kenny (and I do), but they are awesome together. Really awesome. Reynolds has great charisma and knows how to push Kenny’s buttons. At one point during an MLB Tonight episode last season, I literally rolled on the floor (read: couch) laughing at this exchange. HR: Yeah, yeah whatever, real baseball people don’t care about that stuff. Kenny: They do, come to the SABR conference with me and see managers and GMs there. HR: Do you wear your Star Wars costume to the convention? This would be funnier if I had a clip, but trust me, it was hilarious. CanPredictBall does the same thing from the opposite perspective. Awesome stuff. 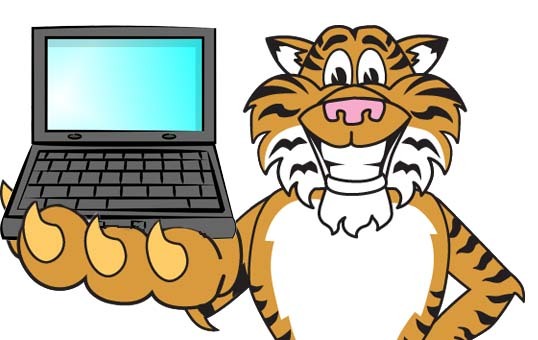 A few weeks ago, Sullivan retired from the Mariners blog Lookout Landing, which he created about ten years ago in favor of spending more time working for Fangraphs and working on other things. At that time, I posted his final column and remarked that if I had been born in the American northwest, I would have liked to have been Jeff Sullivan. He is quite simply, the best. The voice he achieves in his writing is among the best I’ve ever read (not just among sportswriters) and he picks up on the best things about baseball. He writes a lot of posts on pitch framing and pace and weird things that happen like Jesus Montero throwing out Mike Trout attempting to steal. If I write anymore, I think my wife will get jealous, but sufficed to say, Sullivan makes baseball fun. Who makes baseball fun for you? Can your mom pronounce baseball names? Yesterday, we published a post regarding bold predictions for the upcoming baseball season. In this post, we made predictions based on little, but that were at least somewhat reasonable. This post will go a step further. Here are ten crazy predictions for 2013. Think of these as the bold predictions that were left on the cutting room floor. 1. A fan of the Miami Marlins will conduct a protest so dynamic that it will make national, non-baseball news. Jeff Loria will celebrate by kidnapping his dog. 2. During Hall of Fame weekend, in which no one will be inducted, a member of the BBWAA will be arrested under suspicion of committing a crime and will be convicted based on shaky evidence. He will not get the irony. 3. Ben Zobrist will become the first baseball player to ever play two positions simultaneously when he plays both 2B and RF at the same time, allowing Joe Maddon to invent a new position called “superfield.” Ben Zobrist will also play that. 4. Ryan Raburn will hit 20 HR. They will all come against the Tigers. 6. Jason Heyward will have a slump during June. Later in the season, he will attribute it to the fact that his last name isn’t Upton and he felt left out. 7. The All-Star Game will end in a tie. Selig will suggest awarding home-field advantage to the team whose fans send him the most letters. 8. Justin Verlander, desperate for his first career hit, will enter the batter’s box in Prince Fielder’s lucky pants. He will lace a single to right, but will fall down running to first, allowing the outfielder to throw him out. 9. Cubs fans will arrange an elaborate ruse in which they pretend as if they won the 1994 World Series. Eventually, the will start to believe it. 10. The Pirates will win more than half of their games. Well folks, what we’ve all been expecting to happened has finally happened. 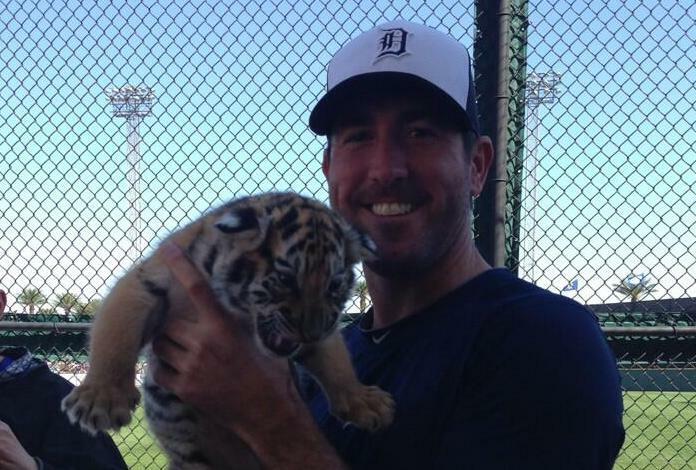 Justin Verlander will be a Tiger (essentially) for life. Today he (effectively) signed the largest contract ever for a pitcher, coming in at a cool 7 years and $180 million with a vesting option for 2020 worth $22 million, for a potential total of $202 million, surpassing Felix Hernandez’s 7 year, $175 million deal from earlier this offseason. After the Felix deal, I discussed what I thought Verlander was worth and guessed at what he would earn. I figured 8 years and $210 million if he signed this early, but it now looks like the Tigers effectively signed a seven year deal with an option for an eighth given that he is already under contract for 2013-2014. We can debate about whether or not that is a fair comparison, but let’s just think about the deal. The Tigers now have Verlander through age 36 (37 with the option) and will pay him close to $26 million a season on average. Given the current going rate for a win above replacement (WAR), Verlander needs to be worth around 5 WAR per season on average to earn his keep, but that’s before we adjust for contract inflation which will likely mean he will need to average somewhere around 4.5 WAR per season for the rest of his career. For now, that should be pretty easy given that he’s been averaging 6 WAR or better for the last four seasons, but we should expect some regression as he ages near the end of the deal. So long as he stays healthy and ages relatively well, the Tigers won’t regret this from a purely baseball perspective. But it’s more than that. On the field, he’ll probably earn this deal or close to it given his skill level and durability, but he’s also worth a lot to the Tigers as a brand. If you go to Comerica Park, you’ll see more Verlander gear on fans than any other player. He’s the face of the franchise and a huge moneymaker in the pro shop. Plus he’s such a big supporter of the city and fan base as a whole. I haven’t thought about this enough to be sure, but I’m not sure there is a more beloved athlete by his home fans than Verlander in sports right now. Maybe Tom Brady. Maybe Derek Jeter. But it’s a short list of contenders for a few key reasons. First, Verlander is homegrown. He’s only ever played for the Tigers. Second, he has absolutely no off-field problems like Kobe Bryant or Miguel Cabrera. Third, he embraces the relationship. Fourth, he is really good at baseball. So I love this deal. It’s a fair price for the Tigers and Verlander gets to become the richest pitcher in the game until Kershaw signs his extension. But I love it because it means Justin Verlander, likely the greatest Tiger of my lifetime thus far, will be a Tiger for his entire career. He will go into Cooperstown having played for only one team. That’s rare today and it demonstrates a level of loyalty that is important to me. I love athletes who are loyal to their team. Verlander has now locked in that status for life. The Dodgers or Yankees might have offered him more after 2014, but the Tigers offered him enough now, so he took it. He’ll spend the rest of his playing days trying to bring titles to the city that he loves, and more importantly the city that adores him. If you’re not a Tigers fan, you might not have a good understanding. When Verlander is on the mound, Detroit (and Michigan) stop. When people say, “When’s he pitching next?” you don’t have to ask who they mean. When he throws a gem, the standing ovation is on another level. We love Justin Verlander in a way that we can’t love most athletes anymore. Either their bad people in the private lives or they jump ship for more money or more glamour. Justin Verlander is neither. They don’t build statues for people who leave town for more money and they can start building his statue now. He’s the real deal. If he blows out his elbow in two years, I won’t look back on this deal as a mistake. At this moment in time, he is worth it. He’s more worth it than any other pitcher in the game and he means more to Detroit than he ever would to anyone else. Justin Verlander will be a Tiger for life. He will, for now, be the richest pitcher on the planet. Opening Day is in three days and his first home start should be eight days from now. I promise you, when he leads the team onto the field with “Til I Collapse” playing on the stadium speakers, Comerica Park could cave in. Detroit has always loved Justin Verlander. Now we know he loves us too. Editor’s Note: This was perhaps not even the coolest thing JV did today. See below. Today, Fangraphs and Baseball Reference consummated a relationship we knew to be coming for the last few weeks. While the two sites have always calculated Wins Above Replacement (WAR) differently, they decided to discuss reworking a component of the metric. That component was replacement level, defined as the production of a player who is readily available as a minor league free agent or on the waiver wire. Today it happened. Dave Cameron can give you all the specifics over at Fangraphs, and I can’t say I disagree with any of the changes. I like that the two leading sites are working to improve WAR and our overall statistical evaluation of baseball. This is a step in the right direction and it’s good for everyone involved. But there is a weird result from today’s unveiling of the new replacement level that is freaking me the hell out. Everyone’s WAR is slightly different than it was yesterday. Now many who hate sabermetrics might use this as a point of assault, but those people who know better know that it’s just a shifting baseline calculation that marginally changes the precise point value of WAR. The substantive results are the same, just refined. But for someone who reviews baseball statistics quite religiously, it’s trippy. For example, Justin Verlander gained 0.2 WAR for 2012. Buster Posey lost 0.4 WAR. Most of the exact changes are pretty small and don’t change the interpretation much, but when we’re dealing with something like WAR that is imprecise and on a relatively small scale, things get funky. A bunch of players shifted places in rankings. Not dramatically, mind you, just from 2nd to 3rd or 8th to 7th. It’s minor and doesn’t mean much, it’s just weird. I woke up today and the past had changed. I mean, I know that isn’t true, but it seems like it. Justin Verlander was the best pitcher by WAR last season, but now he is the best by more. Perhaps this means nothing to anyone else, but it was interesting for me. WAR got better today and given the people in charge of its design, it will continue to get better into the future. Let’s just hope I’m better prepared to cope next time and don’t spend an hour of my day staring at my computer repeating “this is weird” to myself. That’s it folks. 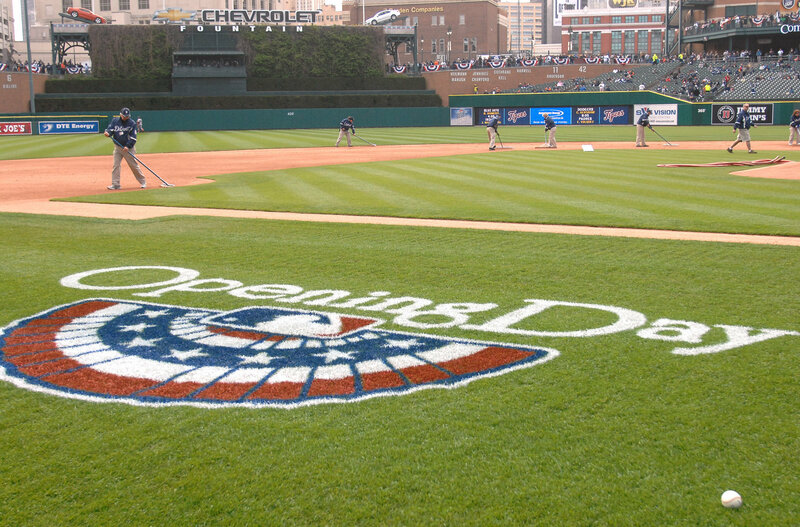 Coming in hot off the presses, by which I mean Twitter, the Tigers have locked in their Opening Day roster. It’s no surprise that Danny Worth was the odd man out, because Santiago makes more money and doesn’t have options left, despite probably being the better player at this point in time. Worth will be back soon enough. The bigger news today was that Bruce Rondon failed to make the team and will start the year in Toledo with the Tigers going to closer by committee for the foreseeable future. I don’t like how they handled Rondon, but I am a big fan of closer by committee, so I can’t hate this too much. If Leyland actually sticks to a committee, this is going to be awesome to watch. Pena, Kelly, and Tuiasosopo round out the bench and Downs locked down the final bullpen spot for now. The rest of the team was pretty well set from the start and everyone remains healthy for the time being. It’s hard not to like the team on paper, with countless projection systems and prognosticators picking them to be one of the best teams in the league and the surest bet to make the playoffs of any club. This time Monday, we’ll be watching the first game of the season and dreaming on what this team could do. Not long now, friends. Not long at all. I like Bold Predictions posts because they’re an excuse to make stuff up. A lot of people, (I’m looking at you Jon Morosi and Jon Heyman) make things up and call it analysis, but here at STT, we always need concrete reasons to believe things. Except when making Bold or Crazy predictions. When you open a post saying this is all made up, it gives you license to go crazy. What follows is the product of that craziness. Editor’s Note: The first six bold predictions were included in our divisional preview series. 1. Carl Crawford will be a platoon player by August. 2. Freddie Freeman will make the All-Star team. 3. Anthony Rizzo will finish in the Top 10 of the NL MVP voting. 4. Houston will win the season series against one divisional opponent. 5. The Yankees will listen to trade offers for Cano and Granderson in July. 6. Joe Mauer will regain some power and hit 20 HR. 7. Shane Victorino will be the Red Sox best outfielder. 8. Clever women from Cleveland will come up with a funny name for a group of fans that adore Nick Swisher to replace Grady’s Ladies. 9. Peter Bourjos will have a higher WAR per PA than Josh Hamilton. 10. Chase Utley will be the best second basemen in the league. 11. Choo will stick in CF. 12. Brandon Belt will finally be left alone to play. 13. Troy Tulowitzki will accumulate more WAR than the Rockies entire starting staff. 14. People will start to notice Jonathan Lucroy is good. 15. Someone will vandalize the Marlins homerun statue. It will be Giancarlo Stanton. 16. When excitedly encouraging his third base coach to send runners home, Ron Washington will accidentally begin to fly. 17. Watching Chris Sale’s delivery will require Tyler Flowers to need Tommy John’s Surgery. 18. The Orioles will have a losing record in one run games. People won’t understand. 19. There will be 800 stories written about R.A. Dickey’s knuckleball and the dome in Toronto. 20. Lynn Henning will finally admit that Jhonny Peralta owes him money. 21. Someone on the A’s I’ve never heard of will play 100 games. And will be good. 22. Adam LaRoche will repeat his big year. 23. The Pirates will win more than 81 baseball games. A sinkhole will swallow PNC Park right before the final out of the season, invalidating the accomplishment. 24. Despite the shorter fences, Petco Park will allow fewer homeruns. 25. Martin Prado will have a higher WAR than Justin Upton. 26. Allen Craig won’t spend time on the DL. 27. A Mets starter will throw a no-hitter. 28. Brendan Ryan will hit .220 or better. 29. Eric Hosmer will bounce back. 30. James Loney will dunk himself in the Rays magic and have a good season. Are these bold enough? Too bold? Comment below about the level of boldness you observe and desire. In February, I wrote up Preseason Power Rankings (30-21, 20-11, 10-1) and Win-Loss predictions for all thirty clubs. The next step in any process of this kind is to discuss how these predictions will manifest in October. Let’s review who made the cut. And now let’s play it out! Think October will go differently? Let us know in the comments or on Facebook. Should October actually go differently, feel free to pretend you never read this. So this is where I wonder about how consistent I have to be. In my divisional season previews and The Nine best lists, I boxed myself in. I listed MVP’s of each division which included Evan Longoria, Justin Verlander, and Mike Trout. Logic dictates that I have to pick one of those three players for the league-wide award. I, however, ranked Miguel Cabrera over Longoria in my third base rankings, meaning I can’t logically pick Longoria. So I have to choose between Verlander and Trout. Those are my only two choices. But, darn it all, I want to pick Longoria. Perhaps my caution earlier in the winter will protect me from the potential Longoria injury. I’ll spare you my inner dialogue and get on with it. Am I bitter about last season? Nah. Awards don’t really matter, so all of the ink we spilled over Trout vs Cabrera last fall was a little much and the cool sobering winter has hopefully dampened the flames of the baseball Civil WAR (get it?!). That said, Trout is just an amazing all-around player. He had an all-time great season at age 20 and was a full two wins better than anyone else in the sport in 2012. There’s no way he posts another 10 WAR season in 2013, but even if he regresses 25% he’ll still be among the best two or three players in the game. He is among the best baserunners and defenders in the sport and tied with Cabrera as the best offensive player in the game in 2012 with a wRC+ of 166. Let’s not forget he did everything that he did last season while missing April trudging around AAA. In a just world, Trout would have won the award last season, but Cabrera won the Triple Crown and the sway of the writers who can’t handle basic math and/or watching defense. But let’s not worry about what happened before and focus on this. 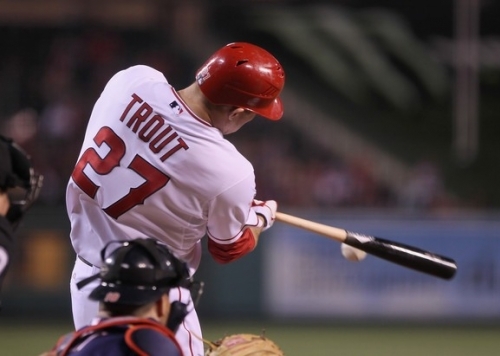 Players who perform like Trout did at age 20 almost always have great careers. Mike Trout is a legitimate five tool player. Mike Trout plays on a good team. Mike Trout is no longer a rookie, so the bias should be gone. The world always leans toward progress. My awards picks are rarely bold and this one is no different. Trout was the best player last year and I think he will be again, but what are the odds he’s the best player again while someone else wins a Triple Crown? Probably lower. I mean, when has that ever happened? Can Mike Trout follow up his 2012 runner up with an MVP award? Or will a big slugger take the crown? Sound off. Last season, Buster Posey narrowly escaped a repeat campaign from Ryan Braun to claim his first MVP award. This season, both men will make a run at the award and will likely finish in the top five or six spots in the voting. But the award will go to the game’s best hitter. Posey is the best hitting catcher and the leader of a great pitching staff. Braun is a great hitter, but adds a good amount of value on the bases. Tulowitzki brings lots of value with his defense and his position. Heyward is a great all-around player. The guy I’m picking here is the best at the plate. He’s no slouch in the field, but he is king in the box. 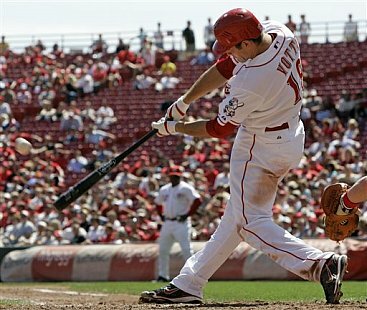 Dude, Votto is ridiculous. He missed time last season with a bad knee, but for the 111 games he was on the field, no one was on the same planet at the dish. Not Miguel Cabrera. Not Mike Trout. He hit .337/.474/.567 with a league leading .438 wOBA and 177 wRC+. He failed to qualify for the batting title because of the injury, but it’s not like he did this in 50 games. This was 111 games and 475 plate appearances. And it’s not like he doesn’t have a history of being awesome. Add this together with his preposterous ability to never hit infield popups or foul balls you have the most can’t take your eyes off him batter in the game. He’s a strong defender too. Votto got on base more than 5% more than Joe Mauer last season and Mauer was the second best on base guy in the league. Votto walked in 19.8% of his plate appearances. And struck out in fewer. His power is insane. The knee looks good this Spring, so we can assume he’s healthy and only has one other season in which he played fewer than 150 games. He’s 29 and in his prime and, for my money, the best hitter in the sport. As an opposing pitcher, no one scares me more than Votto. As someone who loves baseball, he’s amazing to watch and will be an MVP worthy of your attention this season. Think Posey or Braun will outdo Votto in 2013? Sound off, but don’t you dare say RBI!